Last Monday, I lost a good friend. Many people lost a good friend. The Olde Man and Scythe pub in Bolton lost an outstanding Landlord, and the world lost a gentleman. When I first came toBolton nearly 15 years ago– to put it bluntly – I made right balls up of things. I completely flunked my first year of university, Home life was dreadful. I struggled to pay rent on a house with no heating, no double glazing, and mushrooms growing on the carpet. (I kid you not: actual mushrooms.) I drank too much, smoked too much, and had really started not to care about anything, least of all myself. John Jewitt, Landlord of the finest pub in Bolton, must have seen something in me as my friends and I whittled away many an evening on the lethal cider that the pub is notorious for. We got chatting and he offered me a job. I already knew how to pull a good pint, but John taught me more. I learned how to clean the lines and change a barrel. I learned how to serve Absinth properly. I learned how to toughen up, have a purpose and a job I was good at. I learned how to cash up, stock take, break up fights and fathom even the broadest Bolton accent. Having that job allowed me to save up and pay for the Sign Language courses I attended: courses that now allow me to do the work I love so much today. When someone is taken from us suddenly we feel so cheated. John died on holiday, swimming out into the Lanzarote sea. 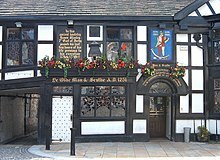 The Olde Man and Scythe closed immediately on hearing the news – only the second time it has done so in its long history. The shock waves of the awful news are still rippling throughout Bolton, gently touching the hearts of so many people. Mine is just one story. One account of how much this man did for me, how grateful I am, and how much I will miss him. He also leaves behind a much-loved family and far closer friends than I, yet I just had to put my words down. I had to acknowledge the passing of this truly good man. John: You were an excellent chess player and a dedicated pipe smoker. You were a spirited dancer (I will never hear Status Quo without thinking of you) and one of life’s true gentlemen. A brilliantly dirty laugh and a big, big heart: you will be long remembered by so many. Most of all; you were an excellent employer, who swiftly became a mentor, a father figure, and then a friend. Just beautiful, and a very heartfelt post. I have tears in my eyes reading this because the love that you have for this father-figure is apparent. Keep the memories strong, lovely lady. I am in tears now, what a beautiful post. When I first met John, it was through Mick. I’d just finished at the Pack Horse and suddenly was working at the Old Man. I spent many a night (with you!) talking to John and the one thing I will always remember is that he loved to talk. He loved to sit and talk and always had time for you. You know what? He never knew me from Adam but I think it was Mick who told him to give me the job- I started the next day! He trusted me and he welcomed me into that funny old family at the pub. You’re right- the world has lost a gentleman. That’s sad. Sorry to hear.